Today’s walk was at Bradgate Park in Leicestershire. Bradgate Park is a delightful relatively unspoilt area probably most famous as the birthplace of Lady Jane Grey who was Queen of England for nine days before being beheaded in 1554. Her home is now a ruin preserved as an ancient monument but is quite beautiful with delicate patterning in the Tudor brickwork. Anyway, the weather was much improved today with most of the snow gone and none of the biting wind that we’ve had for the last couple of days so we decided to go for a walk. Unknowingly we had chosen Leicestershire’s half-term so there were lots of children and parents doing the same as us and letting the children have a good run around. The children had scared away most of the birds (or they had more sense than to be out and about) so instead, I pointed my trusty camera at the deer that roam around the park. Getting a reasonable picture was not as simple as one would first suspect. At the sight of a camera, most deer turned around and walked off, presenting an attractive view of their backsides, not something that was worthwhile publishing. Eventually though, I got a couple of pictures of bucks wandering around. You would think that the darker one in the background with the larger antlers would be the dominant one but not so, he had been doggedly pursued by the lighter one nearer to the camera (but still some 50 yards away) who seemed to be intent on keeping him moving at all costs. 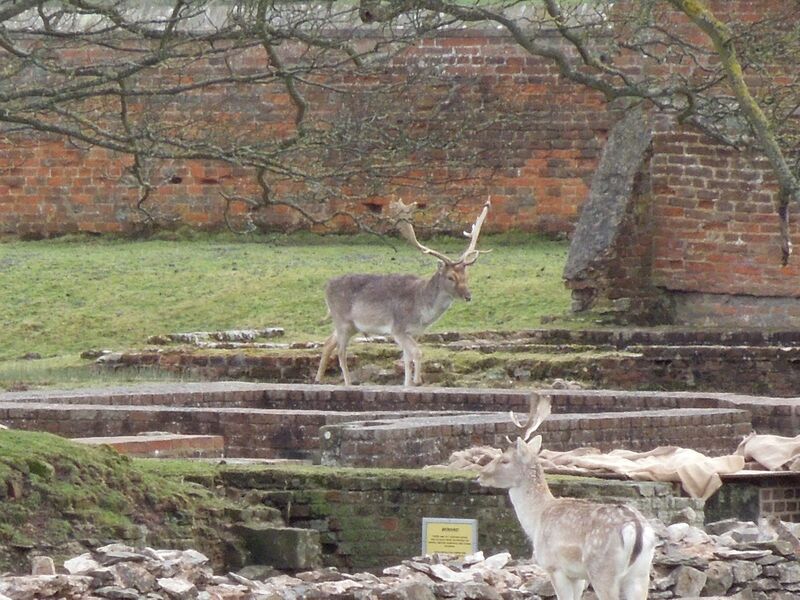 This picture was taken in the ruins of Bradgate House. The weather was much nicer than it has been recently but the gentle babbling brook that we saw in the summer had been turned into a raging torrent, very close to breaking its banks all the way down. If we continue to get rain in the way we’ve had for the last few months, its going to be hard to see how the ground will dry out. This entry was posted in Wildlife and tagged fallow deer, nature, outdoors, wildlife. Bookmark the permalink.